The Los Angeles Dodgers won the 1963 World Series against the New York Yankees with the Dodgers sweeping the Series in four games to capture their second title in five years. Opening Day for the mid century modern stadium - April 10, 1962 - was only days before the Studebaker Avanti was unveiled at the New York Auto Show (April 26, 1962). Like the Avanti, Dodgers Stadium is a beautiful example of mid-century modern American design. 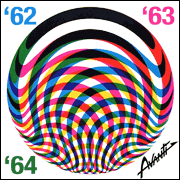 Dodgers pitcher, Sandy Koufax, was to be a future Avanti owner according to some sources (not authenticated). Portraits of Dodgers greats are emblazoned on the outside of the mid-century modern Dodgers Stadium. 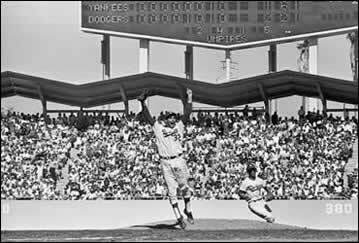 Through the years, Dodger Stadium has seen legendary moments, such as Sandy Koufax's perfect game in 1965. The stadium was designed by architect Captain Emil Praeger (USN) in consultation with former Dodgers owner Walter O'Malley. Sandy Koufax celebrating on the mound after the Los Angeles Dodgers defeated the New York Yankees in the fourth and final game of the World Series in Los Angeles, Oct. 6, 1963. 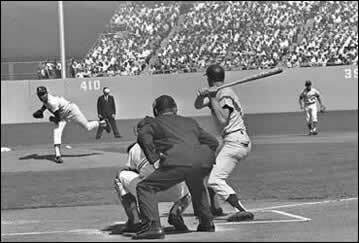 Sandy Koufax struck out 23 batters in the Dodgers’ 1963 World Series sweep of the Yankees, including 15 in Game 1.